Idlis are a popular fermented South Indian dish that can be enjoyed during any part of the day. Although it traditionally finds its origin from the southern part of the country, it is no more confined to boundaries. Prepared by soaking rice and dal(s) overnight, this dish is usually served with sambar and chutney. There are many variants and experiments, and numerous idli-making styles as well. 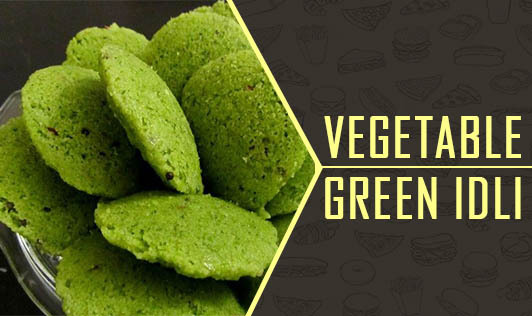 Now here is a new idli recipe, that not only has cereals, but also pulses, vegetables, and a dairy product. The best part is, this recipe requires no overnight soaking and fermentation. 1. Heat 1 tbsp of oil in a pan. Add the semolina and vermicelli to the oil and sauté till light brown. Keep aside and let it cool for some time. 2. Heat 1 tbsp of oil in a pan. Add finely-chopped carrot and tomatoes and sauté for a minute. Keep aside and let it cool for some time. 3. Combine the semolina-vermicelli mixture, carrot-tomato mixture, boiled corn and peas, and curd to form a thick batter-like consistency. 4. Distribute into greased idli moulds and pressure cook on high flame until done (3 whistles is usually recommended). 1. Cool the steamed spinach leaves and grind to make a puree. 2. Heat 1 tbsp of butter in a pan. Sauté chopped onions until golden brown followed by chopped capsicum. 3. Add chilli powder, turmeric powder, and salt. 4. Add the onion-capsicum mixture to the spinach puree. Allow to cook for 2 minutes. 5. Pour the gravy on the idlis. 6. Garnish with sliced tomatoes (optional).